QA Graphics — Infinite Automation Systems, Inc. 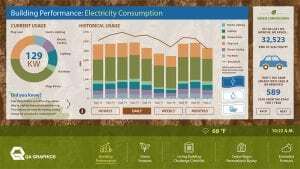 The HTML5 Energy Efficiency Education Dashboard® v6 is run with the QA Gateway. An embedded Data Acquisition System powered by Infinite Automation Systems’ Mango Software Platform. QA Graphics is a leader in the building automation and green building industries. The company specializes in HVAC graphic development services, system graphics, floor plan graphics, and Energy Efficiency Education Dashboards™ (EEEDs). The company also provides custom marketing solutions such as interactive applications, 3D design and animation, UX design, web development, videos, and more. QA Graphics and Infinite Automation Systems will unveil QA Gateway, an embedded Data Acquisition System powered by Infinite Automation Systems’ Mango Software Platform. The QA Gateway is a standalone data logger that allows you to collect data in real time from multi-source protocols accurately and efficiently. To display real-time data, the solution integrates with existing automation systems and does not require custom software or an internet connection, thereby eliminating security risks. It can be easily deployed in any network configuration, conforming to IT security policies, and the gateway allows you to view collected data through its easy-to-use, web-based interface.